Emma Hansen - My 3 Favourite Superfood Smoothies, Pregnancy Approved! My 3 Favourite Superfood Smoothies, Pregnancy Approved! When you’re eating for two you find you’re much more aware of the nutritional content of foods you eat. It’s not about counting calories it’s about counting how many grams of protein you get in a day, or how much folate you’re eating, or how much calcium is in a meal. I found the best way to make sure I was ingesting what this baby needed was to make daily smoothies. Not those smoothies with fruit juice and ten kinds of frozen fruit – I don’t want this baby to be munching on sugar the entire pregnancy. I’m talking about smoothies with oats, avocados, chia seeds, nut butters, kale, spinach etc. Yumm. 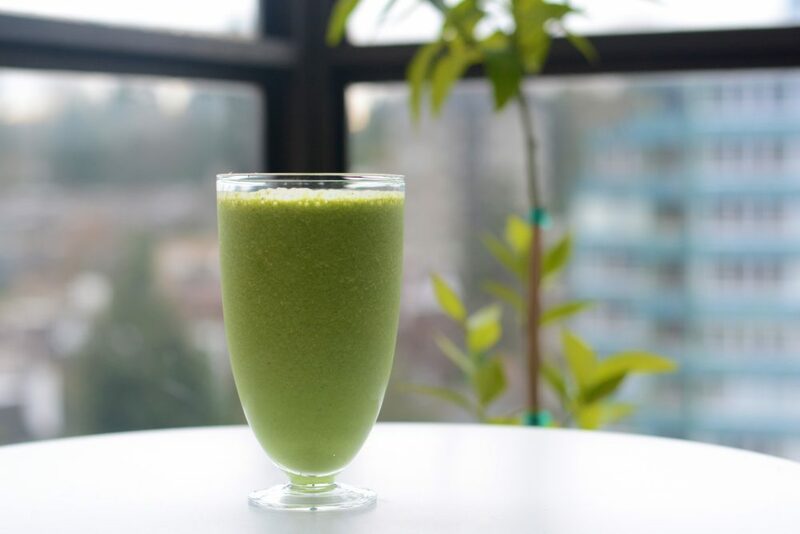 So here are my 3 favourite go-to nutrient dense smoothies that I add to my daily pregnancy diet – you can bet I’ll still be making my smoothies like this post-baby too! I like to blend all of my fresh/dry ingredients with the almond milk first and then add the frozen ingredients and ice. Blend on high for about a minute and enjoy! You may need to add more almond milk depending on your blender – this goes for all of these recipes. *One ingredient non-GMO protein powder is best for pregnancy (i.e. avoid anything with ingredients you can’t pronounce – especially sweeteners), so rice protein powder is my choice. Always check with your health care provider if you’re unsure! **To make almond ice just freeze some unsweetened almond milk into ice cube trays! It makes smoothies denser instead of watering them down with regular ice cubes. For this one I like to blend the oats first until they’re mostly in a fine powder. Then I add everything except the frozen banana and blend until smooth before I add it at the end and switch to high speed. *If you don’t have medjool dates on hand you can substitute for a couple tbsp. of pure Canadian maple syrup (none of that sugar free processed garbage). Blend everything except the ice first. Then add the ice and blend on high until smooth and creamy! If you want to take this the extra mile and turn it into more of a treat you can add whipped coconut cream like Angela from Oh She Glows suggests in her recipe. *To make coconut ice simply freeze coconut milk into ice cube trays.